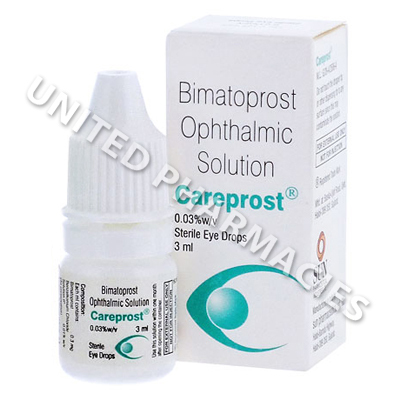 Careprost (Bimatoprost Ophthalmic) is a medicated solution applied to the eyes as a treatment for open angle glaucoma and ocular hypertension (increased pressure in the eye). This pressure is caused by a build up of a fluid called aqueous humour within the eye. By increasing the amount of this fluid drained from the eye, this product helps to treat the above mentioned conditions, thereby preventing serious damage to the eyes. The active ingredient in this product can help to increase eyelash growth, and some patients use it for this purpose. When applied to the eyelash using a special brush, it may promote eyelash hair growth. If treating glaucoma or ocular hypertension, Careprost (Bimatoprost Ophthalmic) is instilled directly into the affected eye or eyes. Follow your doctor`s instructions. Most adult patients are told to apply 1 drop in the eye or eyes requiring treatment once per day, in the evening. Continue using it for the entire period prescribed by your doctor. Do not apply this product to the eye if you are treating insufficient eyelashes. Use a special single use applicator brush to apply the solution to the skin margin on your upper eyelid. It should be applied from the inside of the lash line to the outside. Remember not to get any of the solution on the skin of the eyelid or the surrounding area. If this happens, wipe it clean. This will avoid discolouration of the skin. Remember that this product could change the colour of the eye to brown, and may cause the skin surrounding the eye to become darker. Patients who use it to treat glaucoma may notice that their eyelashes grow in length. Remember to wipe away any excess solution, and go and see your doctor if any discolouration of the eyelid is noticed. See your doctor straight away if you notice your eyes becoming sensitive to light, swelling of the eye or redness in the eyes. Patients who use this product in one eye only may notice that there is a difference in the colour of the eyes. This may occur over a long period of time, and may be permanent. It is essential that you discuss all the risks with your doctor before you use this product. Patients who use this product to help the eyelashes grow longer should note that if use of this solution is ceased, the eyelashes will return to the length at which they were before treatment commenced. Always use Careprost (Bimatoprost Ophthalmic) as you have been prescribed by your doctor. Never self-medicate or change your dosage without first consulting your doctor. The correct dosage can vary depending on your health, medical history, and the severity of the condition being treated.